You can relax while we take care of the details. John Wayne Airport released their March 2013 statistics showing that air travel in and out of John Wayne has increased in the last year. Compared to March 2012, John Wayne airport showed a 6% increase in passengers severed during March 2013. This includes a significant increase in people traveling internationally. However, even with the increase in passengers, there has been a decrease in total aircraft operations (take-offs and landings). Motor Trend recently compared the new Acura RLX to the Cadillac XTS4. Each sedan has areas where it outshines the other, but overall, the Cadillac XTS4 was crowned the better vehicle. Motor Trend compared elements of exterior styling, interior comfort, handling and power. 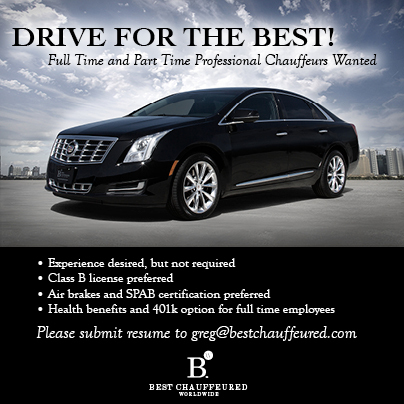 It is no wonder that Best Chauffeured added the Cadillac XTS to its fleet in order to continue providing superior service to clients. The International LCT Show this year showed an abundance of innovation with many new vehicle choices emerging on the Show floor. The limousine vehicle market is experiencing a full-blown competition between Detroit’s Big 3: Ford/Lincoln, GM/Cadillac, and Chrysler. These auto makers have recently put special emphasis on their chauffeured vehicles which has led to a growth in options for industry operators. As the technological world continues to develop, limousine and chauffeur companies continue to incorporate new mobile devices and apps into their services. Well-qualified experts at the 2013 LCT Leadership Summit will present and debate the positive and negative effects of using mobile devices and apps in relation to the limousine industry. Best Chauffeured Is Now Mobile! We recently launched our mobile site! Now you can easily view our website, choose a vehicle and make reservations from any mobile device. With the all new Best mobile site, the ease and reliability of booking with Best Chauffeured is always right at your fingertips. 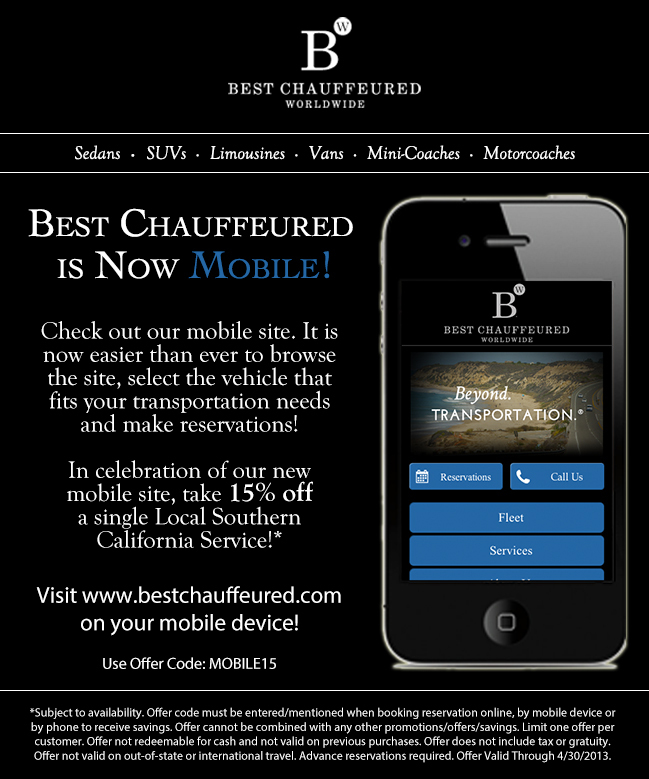 Check out our new mobile site from any mobile device to see the new way that Best is going beyond transportation. To celebrate we are offering 15% off a single Local Southern California Service. Lamborghini may be branching out from their traditional sports cars. They have released a concept of a Lamborghini Aventador Limo. The video of this concept car has already received over 500,000 views and, with proper investment, this premium limousine may materialize in the future.